When it blooms in the spring, often before the leaves appear, flowering quince (Chaenomeles speciosa) and its hybrids (Chaenomeles x superba) are arresting sights. The shrub covers itself with showy, single to double, about 2-inch-wide flowers that are white, pink, red or orange. The deciduous bushes grow 5 to 10 feet tall and wide and are hardy in U.S. Department of Agriculture plant hardiness zones 4 through 9. 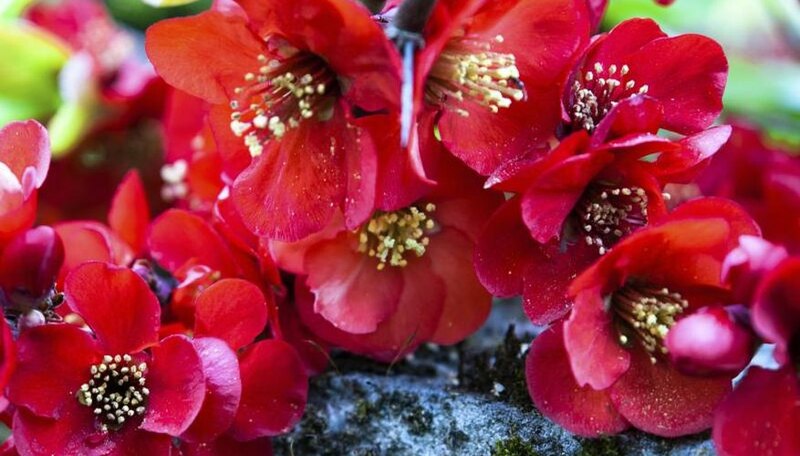 Use easy-to-grow flowering quince for borders, hedges, barriers or bonsai specimens. Flowering quince grows in almost any soil type but prefers moist, well-drained soils that are somewhat acidic. It tolerates dry conditions and wind. This wide range of soil tolerances is mirrored in the wide tolerances of light conditions the shrubs display -- they grow in shade, partial shade and full sun. You can use them in woodland gardens, sunny slopes or dappled shade. The thorny branches of the species and many hybrids can have more compact growth in full sun. Some cultivars are thornless. When added to the landscape, flowering quince needs regular, deep watering during the first year. Once established, the bushes can be drought-tolerant, although they prefer even moisture. Rainy, warm summers can be a problem for the hybrid flowering quince "Texas Scarlet" (Chaenomeles x superba "Texas Scarlet"), which has tomato-red flowers and grows in USDA zones 5 through 9. Water-splashed foliage becomes susceptible to a fungus disease which causes leaf spot and can defoliate the plant. Clean up and dispose of all the fallen leaves to prevent disease recurrence. Apply a general-purpose controlled-release fertilizer to quince in the spring as new growth is beginning. Use a formulation such as 15-9-12 that lasts for eight to nine months at an average temperature of 70 degrees Fahrenheit. Apply to soil at the rate of 1.3 pounds per 100 square feet. Scatter it evenly over the soil surface around and under the bushes and mix it into the top layer of soil. Flowering quince doesn't need much pruning. Taller bushes have a naturally mounded shape, and lower-growing varieties, such as white-flowered "Jet Trail" (Chaenomeles x superba "Jet Trail") which grows 3 to 4 feet tall and wide in USDA zones 5 to 8, have low-maintenance growth that is suitable as a ground cover. Prune the shrubs in spring after flowering, primarily to keep them to the size you desire. You can accomplish some pruning by cutting branches in spring when buds are present for forcing bloom indoors or when you harvest blooming branches for flower arrangements. Before doing any pruning, clean pruners with a cloth dipped in rubbing alcohol to prevent possible disease introduction. For city-dwellers, flowering quince is a good choice because it tolerates urban air pollution. Newer hybrid flowering quinces, such as the "Double Take" series introduced in 2010 by North Carolina State University, have smaller statures, usually about 4 feet tall and wide; these are suitable for smaller spaces typical of city gardens and need less pruning to keep to size. Plants for a Future: Chaenomeles Speciosa - (Sweet.) Nakai. Missouri Botanical Garden: Chaenomeles x Superba "Jet Trail"